Trains from Český Krumlov . . .
Český Krumlov is the second most-visited place in the Czech Republic after Prague. You can see why if you look at the photos on the Visiting Český Krumlov page, which has tips on visiting the city by train. This page explains how to buy train tickets from Český Krumlov to cities in neighbouring countries at the cheapest prices, buying online direct from the operators, usually with print-at-home tickets. Click here to buy tickets starting in another city. Once a day, an express train run by CD (Czech Railways) leaves Český Krumlov at around 14:00 and arrives Prague around 17:00. It's a comfortable air-conditioned express train with 1st & 2nd class and a refreshment trolley, or feel free to bring your own food & drink along. The fare is around 199 CZK (€8) if you book ahead, 283 CZK (€11) if you buy on the day. In first class it's around 368 CZK (€14). You can buy at the station as tickets cannot sell out and seat reservation is optional, or buy online at Czech Railways www.cd.cz and print your own ticket or simply show it on your smartphone screen. You can check times from Český Krumlov to Prague at jizdnirady.idnes.cz/vlaky/spojeni, the English button is at bottom right. However, as the branch line is now run by a private operator you'll need to buy separate tickets as explained here. The GWTR local train has luggage space, a toilet, power sockets and free WiFi, it's a leisurely journey on a winding single track branch line past farmland & forest. At Ceske Budejovice you simply step off one train and walk to the other train, if necessary via the underpass between platforms. Changing trains only takes 3 minutes, but I'd always allow at least 20 minutes just in case of any small delay. Ceske Budejovice might sound more familiar by its former Germanic name, Budweis. That's right, where the name of the beer comes from! Step 2, take an express train from Ceske Budejovice to Prague Hlavni. Trains run every hour or two, the expresses take 2h02, the regional trains around 2h26. The fare is around 169 CZK (€7) if you book ahead, 265 CZK (€10) if you buy on the day. In first class it's around 313 CZK (€12). You can buy at the station as tickets cannot sell out and seat reservation is optional, or buy online at Czech Railways www.cd.cz and print your own ticket or simply show it on your smartphone screen. Tickets for this route are good for any train that day, not just the one you select. 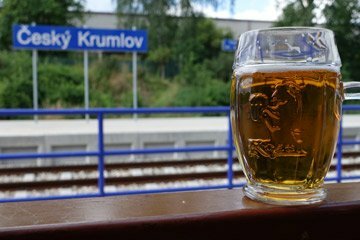 There's more advice on taking the train between Prague and Český Krumlov on the Visiting Český Krumlov page. The branch line train to Český Krumlov is 2nd class only, but comes with luggage space, toilet, power sockets and free WiFi. Private company GWTR took over the line and introduced smart new regional trains in December 2017, the photo below in GWTR's orange & green colours is courtesy of @wanisbunes. There are no seat reservations and tickets cannot sell out, you hop on and sit anywhere you like. Český Krumlov station is quite a walk from the old town, but a taxi to the station only costs around 120 CZK, about €3.50. There's a small rustic bar at the station, an ice-cold Kozel beer hits the spot whilst waiting for your train. See more photos & information about the Český Krumlov - Prague journey on the Visiting Český Krumlov page. 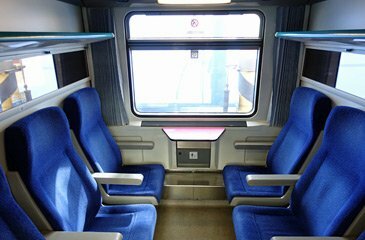 These trains have comfortable air-conditioned cars, usually with 6-seater compartments in both classes, although you'll sometimes see open-plan 2nd class cars. Seat reservation is optional, and indeed most locals don't bother with a reservation. If you choose not to reserve a seat you simply sit in any unreserved seat. There's no catering car, a refreshment trolley with tea, coffee, snacks, beer & wine may come down the train especially at the busier northern end of the route, or feel free to take your own food & drink. You can easily travel from Český Krumlov to Vienna by train in around 4h29 for just €11 with two easy changes of train, at Ceske Budejovice & Ceske Velenice. There's a departure every two hours or so. You arrive at Vienna Franz Josefs Bahnhof in the north of the city, see station location map, although there's also a route via Linz to Vienna Hbf if you need it. Step 1, travel from Český Krumlov to Ceske Budejovice on the little green-&-orange GWTR local train. This runs every hour or so, journey time 44 minutes. The GWTR local train has luggage space, a toilet, power sockets & free WiFi, it's a leisurely journey on a winding single track branch line past farmland & forest. At Ceske Budejovice you simply step off one train and walk to another, via the underpass between platforms. Changing trains only takes 2 or 3 minutes, but I'd ideally allow at least 15-20 minutes between trains in case of delay. Incidentally, Ceske Budejovice might sound more familiar by its former Germanic name, Budweis. That's right, where the name of the beer comes from! The town is worth a look around in its own right. Step 2, travel from Ceske Budejovice to Vienna Franz Josef Bahnhof with one simple change of train at Ceske Velenice. Journey time is around 3h20, with a departure every two hours. There are no reservations, you sit wherever you like. see Vienna Franz Josefs station location map. The change of train at Ceske Velenice usually just means walking across the platform, it takes 2 minutes. Lots of people make this connection, so the Austrian train will wait if the Czech train is a few minutes late. Both Czech & Austrian trains come with luggage space & toilets. The Austrian train from Ceske Velenice to Vienna is 2nd class only, but it's a comfortable Austrian City Shuttle regional train using ÖBB's double-deck air-conditioned Weasel trains. Sit on the upper deck for the best views! (1) Český Krumlov to Ceske Budejovice costs 40 CZK, about €1.55, bought on the day. (2) Ceske Budejovice to Vienna costs just €9 if you book a cheap Sparschiene fare in advance (even booking just a day or two ahead), just remember that Sparschiene fares commit you to a specific departure with no refunds or changes to travel plans. If you want to stay flexible, a Standard (GünTar) ticket costs around €38.20, good for any train on this route that day, unlimited availability, you can buy this ticket at this price online or at the station on the day and simply hop on any train. No reservations needed, you sit where you like, it cannot sell out. To check train, use the Austrian Railways website www.oebb.at. Ask it for Cesky Krumlov to (plain) Vienna. In the search results, look for journeys to Vienna Franz Josefs Bahnhof with 2 changes marked with a greyed out train symbol, then Os then REX. It'll specify via Ceske Budejovice and Ceske Velenice underneath. You'll also see journeys from Vienna Hbf routed via Ceske Budejovice & Linz (Donau), this is a longer way round but the trains are faster so it doesn't take much longer. The trains have first class on this route. However, it's less frequent and more expensive with Sparschiene fares starting at €19, so I'd stick with the direct route unless arriving at the main Vienna Hbf is significantly more convenient for you. Whichever route you choose, www.oebb.at will show fares including Sparschiene tickets, but it will say Ticket for section only. That is because ÖBB cannot sell tickets for the local train between Cesky Krumlov and Ceske Budejovice as this is run by private operator GWTR. The fares shown are for the Ceske Budejovice to Vienna section, so go ahead and buy a cheap Sparschiene ticket, or you can buy the Standard Ticket (GünTar) online or at the station on the day. You can also buy tickets from Ceske Budejovice to Vienna at Czech Railways www.cd.cz - but if you enter Cesky Krumlov to Vienna it'll only show one journey a day, the one that happens to use the one train per day run by CD on the Cesky Krumlov line. If you want to double check GWTR local train times, see jizdnirady.idnes.cz/vlaky/spojeni, English button bottom right. Step 1, travel from Český Krumlov to Ceske Budejovice on the little green-&-orange GWTR local train. This runs every hour or so, journey time 44 minutes. The GWTR local train has luggage space, a toilet, power sockets and free WiFi, it's a leisurely journey on a winding single track branch line past farmland & forest. At Ceske Budejovice you simply step off one train and walk to the other train, if necessary via the underpass between platforms. 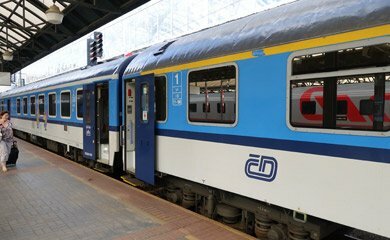 Changing trains only takes 3 minutes, but I'd always allow at least 40 minutes just in case of delay if using a cheap Sparschiene or First Minute fare from Ceske Budejovice onwards as you don't want to miss your booked train. 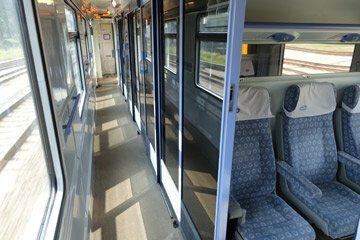 Step 2, travel from Ceske Budejovice to Linz Hbf by comfortable air-conditioned express in around 2 hours, with power sockets at seats. There may be a refreshment trolley, but it's best to take you own food & drink for this bit. Step 3, travel from Linz Hbf to Salzburg, Attnang Puchheim or Innsbruck by swish modern ÖBB railjet train with restaurant car, power sockets at all seats & free WiFi. If you're going to pretty lakeside town of Hallstatt, change again at Attnang Puchheim for the local train to Hallstatt. The train arrives at Hallstatt railway station (Hallstatt Bahnhof) on the east side of the Hallstatter See (Hallstatt Lake). Hallstatt town is on the west side of the lake, so you need to take a ferry called the Stefanie from Hallstatt Bahnhof (to Hallstatt town, this sails shortly after most train arrivals and takes 15-20 minutes, see www.hallstattschifffahrt.at for a timetable. You pay for the ferry separately, at the quayside before boarding. (1) Český Krumlov to Ceske Budejovice costs 40 CZK, about €1.55. (2) Ceske Budejovice to Linz, Salzburg, Hallstatt or Innsbruck: You'll find cheap fares called Sparschiene by ÖBB Austrian Railways or First Minute by CD Czech Railways starting at as little as €9 to Linz, €14 to Salzburg or Hallstatt, or €19 to Innsbruck. A bargain! (2) Ceske Budejovice to Linz, Salzburg, Hallstatt or Innsbruck: Buy tickets using either www.trainline.eu, Austrian Railways www.oebb.at or Czech Railways www.cd.cz and print your own ticket - check both sites and buy from whichever is cheaper, they sell tickets for the same trains. Booking should open 6 months ahead on oebb.at or 90 days ahead on cd.cz, less than this when the mid-December timetable change is approaching. But you only need to book weeks ahead to get the cheap fares, there's no need to book months ahead. Step 2, travel from Ceske Budejovice to Linz Hbf in around 2h02 by comfortable air-conditioned express, with power sockets at seats. There may be a refreshment trolley, but it's best to take you own food & drink for this bit. At Linz Hbf, changing trains simply means stepping off one train, walking to another train and stepping on, but as you will be on separate train-specific advance-purchase tickets I'd allow at least 40 minutes between trains in case of delay. Step 3, travel from Linz Hbf to Budapest Keleti in 4h03 by swish Austrian railjet train with restaurant car, power sockets at seats & free WiFi. (2) Ceske Budejovice to Linz: Cheap advance-purchase fares called Sparschiene by ÖBB Austrian Railways or First Minute by CD Czech Railways start at just €9. (3) Linz to Budapest: Cheap Sparschiene fares start at €29. The price varies, book early for cheaper prices. (2) Ceske Budejovice to Linz: Buy tickets using either www.trainline.eu, Austrian Railways www.oebb.at or Czech Railways www.cd.cz and print your own ticket - check both sites and buy from whichever is cheaper, they sell tickets for the same trains. Booking should open 6 months ahead on oebb.at or 90 days ahead on cd.cz, less than this when the mid-December timetable change is approaching. But you only need to book weeks ahead to get the cheap fares, there's no need to book months ahead. (3) Linz to Budapest: Buy tickets using either Austrian Railways www.oebb.at or www.trainline.eu and print your own ticket. At Ceske Budejovice you simply step off one train and walk to the other train, if necessary via the underpass between platforms. Changing trains only takes 3 minutes, but I'd always allow at least 40 minutes just in case of delay if using a cheap First Minute fare from Ceske Budejovice to Berlin as you don't want to miss your booked train. Step 2, travel from Ceske Budejovice to Prague Hlavni in around 2h26 by comfortable air-conditioned express, with power sockets at seats. There may be a refreshment trolley, but feel free to take you own food & drink. In Prague you may have time for a quick wander to the old town square, it's only 20 minutes walk from the station. Or just enjoy a leisurely coffee at Cafe Coffee Day upstairs in the old historic station hall near platform 1. Step 3, travel from Prague Hlavni to Berlin Hbf by air-conditioned EuroCity train with restaurant car & free WiFi in around 4h25. There's great scenery along the Elbe River valley between Prague and Dresden, see the photos, tips and video on the Prague to Berlin by train page. (2) Ceske Budejovice to Berlin: Cheap First Minute fares from Ceske Budejovice to Berlin start at just €30, or about 760 CZK. First Minute fares are limited-availability advance-purchase fares, they are only good for the specific train you book, limited or no refunds or changes to travel plans. If you buy at the station on the day you pay significantly more for a full-flex ticket good for any train. Step 1, go to the Czech Railways website www.cd.cz and set up an enquiry from Ceske Budejovice to Dresden or Berlin. Tip: It tends to give you ridiculously tight connections in Prague, and sometimes 2 changes when only 1 is really necessary, so before running the enquiry I suggest clicking Connection parameters then Transfers then reducing the number of permitted transfers from 4 to 1 and changing FROM standard to FROM 30 minutes. That'll get you just one change in Prague, of at least 30 minutes. Step 2, now check train times from Český Krumlov to Ceske Budejovice at jizdnirady.idnes.cz/vlaky/spojeni, looking for a train which gets you to Ceske Budejovice at least 40 minutes before your onward train, just in case of delay. The little green-&-orange GWTR local trains run every hour or so, journey time 44 minutes. It has luggage space, a toilet, power sockets and free WiFi, it's a leisurely journey on a winding single track branch line past farmland & forest. Option 1, via Plzen. Cheapest and easiest to book, but around 50 minutes slower than going via Linz. This is the cheapest option, although not the fastest. For example, at the time I write this, you could leave Český Krumlov at 08:14 and arrive Munich Hbf at 17:17 all for just €16.55, with time for a quick wander round Ceske Budejovice and for a Pilsner beer at the station bar in Plzen! Earlier and later departures are also available. The train from Plzen to Munich is a Prague-Munich Zapadni Express, see the photos & travel tips on the Prague-Munich page. This train is air-conditioned with a refreshment trolley, power sockets and free WiFi. Step 1, go to the Czech Railways website www.cd.cz, switch it to English and set up an enquiry from Ceske Budejovice to Munich. Just for fun, first run the enquiry with no clever stuff like I'm about to tell you. No green price buttons, right? Cheap First Minute fares from Ceske Budejovice to Munich start at just €15, or about 367 CZK, a bargain. First Minute fares are limited-availability advance-purchase fares, they are only good for the specific train you book, limited or no refunds or changes to travel plans. If you buy at the station on the day you pay significantly more for a full-flex ticket good for any train. Option 2, via Linz. The fastest route, but needs to be booked in 3 stages rather than 2. This is the fastest and most direct route, with the swisher trains. For example, at the time I write this, you could leave Český Krumlov at 08:14 and arrive Munich Hbf at 16:32 from €40, with time for a coffee or wander in Ceske Budejovice and a leisurely beer in Linz. 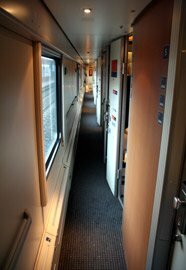 Step 3, travel from Linz Hbf to Munich Hbf in 2h45 by swish Austrian railjet train with restaurant car, power sockets at seats & free WiFi. (3) Linz to Munich: Cheap Sparschiene fares start at €29. The price varies, book early for cheaper prices. (2) Ceske Budejovice to Linz: Buy tickets using either Austrian Railways www.oebb.at or Czech Railways www.cd.cz and print your own ticket - check both sites and buy from whichever is cheaper, they sell tickets for the same trains. Booking should open 6 months ahead on oebb.at or 90 days ahead on cd.cz, less than this when the mid-December timetable change is approaching. But you only need to book weeks ahead to get the cheap fares, there's no need to book months ahead. (3) Linz to Munich: Buy tickets using either www.oebb.at or www.trainline.eu and print your own ticket. An excellent Czech sleeping car leaves Ceske Budejovice at 20:08 every night, arriving Zurich HB at 08:20. Change at Zurich HB for destinations all over Switzerland. This option saves time and a hotel bill, too! The sleeping-car is a modern Czech Comfortline type with 1, 2 & 3 bed compartments with washbasin, and 1, 2 & 3 bed deluxe compartments with en suite toilet & shower. 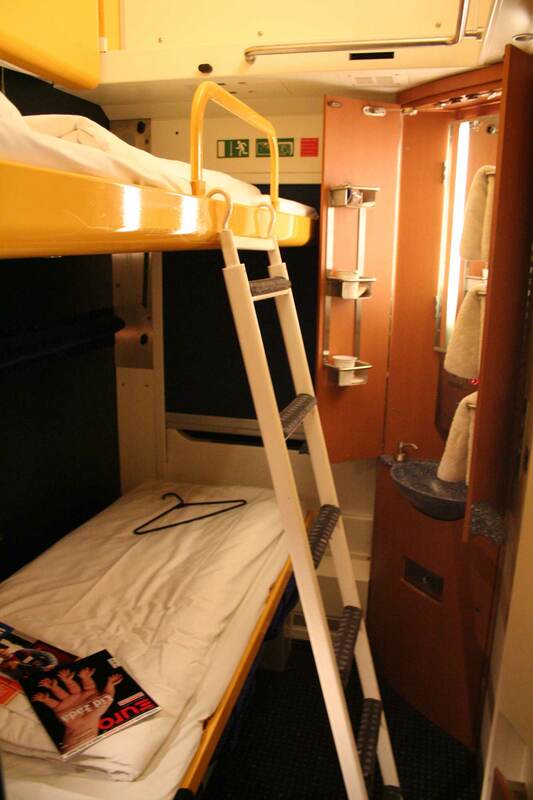 For passengers in the regular sleepers, there are a shower & toilets at the end of the corridor. A light breakfast is included in the fare. Incidentally, there are no couchettes on this train, just a sleeping-car and seats. Step 1, book from Ceske Budejovice to Zurich or most other Swiss stations at Czech Railways www.cd.cz & print your own ticket. 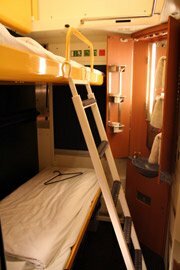 Tip: To book a sleeper, click Modify against Sleeper berths when the reservations page appears and change Sleeper - automatically to Sleeper deluxe - automatically if you want a deluxe sleeper with shower & toilet. Just remember there are only 3 such compartments on the whole train! Click the pencil icon to toggle the type of sleeper between 1, 2 & 3 bed. You are booking berths, not compartments, one person = one ticket = one bed, so if you book 2 people in a 2-berth you get the whole compartment, if you book 2 people in a 3-berth the third bed may be sold to another passenger of the same gender. Tip: You can book from Ceske Budejovice not just to Zurich but to many cities in Switzerland including Interlaken, Basel, Geneva, Brig, St Moritz... Your ticket then includes an onward Swiss domestic train to your final destination. This is much cheaper than buying a separate onwards Swiss domestic ticket from Zurich, which can be expensive. Tip: Unless you ask for every passenger to get their own ticket, you'll get one ticket for however many people your are booking, with just one passenger name necessary to support the print-your-own ticket. Step 2, now look up train times from Český Krumlov to Ceske Budejovice at jizdnirady.idnes.cz/vlaky/spojeni, looking for a train which gets you to Ceske Budejovice at least 60 minutes before your onward train, just in case of delay. The little green-&-orange GWTR local trains run every hour or so, journey time 44 minutes. It has luggage space, a toilet, power sockets and free WiFi, it's a leisurely journey on a winding single track branch line past farmland & forest. Standard sleeper set up as a 2-berth, with blind down & washstand open. Each room can be used with 1, 2 or 3 beds. Enlarge photo. 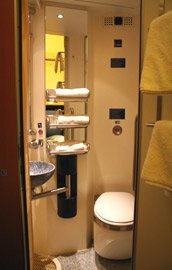 Deluxe sleepers are similar to standard ones, but with a bit more floorspace & compact shower & toilet instead of washstand. Step 1, travel from Český Krumlov to Ceske Budejovice by local train then Ceske Budejovice to Linz by express train as explained above. Step 2, now travel from Linz to Zurich HB in around 6h34 by smart modern railjet train with restaurant car, power sockets at seats and free WiFi. Change at Zurich HB for destinations all over Switzerland. Fares start at just €29. The railjet takes you through the lovely scenic Arlberg Pass, see the photos & video here. Book from Linz Hbf to anywhere in Switzerland at either www.oebb.at or www.trainline.eu and print your own ticket. Tip: I'd allow at least 40 minutes between trains in Linz, preferably a bit more in case of delay, given that you will be on separate tickets. Step 1, travel from Český Krumlov to Ceske Budejovice by local train and Ceske Budejovice to Zurich HB by overnight sleeper as explained above. Step 2, travel from Zurich HB to Milan by ETR610 EuroCity train from €29 (a scenic ride, see the photos & video here) then by onward Frecciarossa high-speed train to Florence, Rome or Naples from €19.90. Book this at www.trainline.eu or www.loco2.com - it's ticketless, you just quote the reference on board the trains. Step 1, travel from Český Krumlov to Ceske Budejovice by local train then Ceske Budejovice to Vienna as explained above. Tip: Read the note in that section about travelling via Linz rather than Ceske Velenice, as you then end up at Vienna Hbf rather than Vienna Franz Josef Bahnhof. Consider an overnight stop in Vienna unless taking a sleeper train. Step 2, travel from Vienna Hbf to Italy by train as shown on the Trains from Vienna page. You'll find two daily railjet trains between Vienna and Venice, a nightjet sleeper train from Vienna to Venice, and a nightjet sleeper train from Vienna to Milan, Florence and Rome. Step 1, travel from Český Krumlov to Ceske Budejovice by local train then Ceske Budejovice to Innsbruck as explained above. Consider an overnight stop in Innsbruck. Step 2, travel from Innsbruck to Italy by train as shown on the Trains from Innsbruck page. Trains link Innsbruck with Verona, Venice and Bologna via the scenic Brenner Pass with connections for Florence and Rome. Step 1, travel from Český Krumlov to Ceske Budejovice by local train then overnight to Zurich HB by sleeper train as explained above. Step 2, travel from Zurich HB to Paris Gare de Lyon by TGV-Lyria high-speed train from €29 as shown on the Trains from Zurich page. Step 1, travel from Český Krumlov to Ceske Budejovice by local train then Ceske Budejovice to Munich as explained above. Stay overnight stop in Munich. See suggested hotels near the station with good reviews. Step 2, travel from Munich to Paris by ICE and TGV Duplex from €39 as shown on the Trains from Munich page. Step 1, travel from Český Krumlov to Ceske Budejovice by local train then Ceske Budejovice to Prague Hlavni, as explained above. Stay overnight stop in Prague. See suggested hotels near the station with good reviews. Step 2, travel from Prague to Brussels Midi via Cheb & Nuremberg from as little as €21 as shown on the Trains from Prague page. Step 1, travel from Český Krumlov to Ceske Budejovice by local train then Ceske Budejovice to Munich Hbf, as explained above. Step 2, travel from Munich Hbf to Brussels Midi by ICE trains from €39 as shown on the Trains from Munich page. Step 1, travel from Český Krumlov to Ceske Budejovice by local train then Ceske Budejovice to Berlin Hbf, as explained above. Stay overnight stop in Berlin. See suggested hotels near the station with good reviews. Step 2, travel from Berlin Hbf to Amsterdam Centraal by InterCity train from €39.90 as shown on the Berlin to Amsterdam page. Step 2, travel from Munich Hbf to Amsterdam Centraal by ICE trains from €39 as shown on the Trains from Munich page. See the London to Prague page, this covers the journey in detail in both directions. 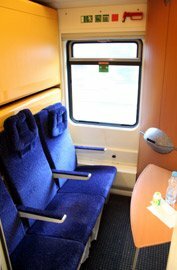 Step 2, travel from Prague Hlavni to Krakow or Warsaw by sleeper train or daytime train as explained on the Trains from Prague page. Option 1, via Prague: Travel from Český Krumlov to Prague as shown above. Travel from Prague to Slovakia, Russia or Scandinavia as shown on the Trains from Prague page. Option 2, via Switzerland: Travel from Český Krumlov to Zurich as shown above. Travel from Switzerland to Spain or the South of France as shown on the Trains from Switzerland page. Option 3, via Vienna: Travel from Český Krumlov to Vienna as shown above. 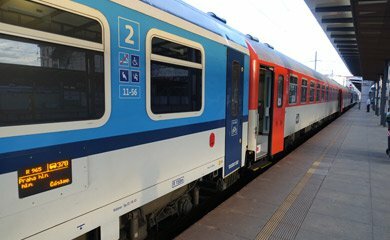 Travel from Vienna to Slovenia, Slovakia, Croatia or Ukraine as shown on the Trains from Vienna page. Option 4, via Budapest: Travel from Český Krumlov to Budapest as shown above. Travel from Budapest to Serbia, Macedonia, Bulgaria, Greece, Turkey as shown on the Trains from Budapest page.